HomeHow to install Magento in Ubuntu ? How to install Magento in Ubuntu ? Now it’s turn to install another eCommerce ‘Magento‘ which is feature-rich eCommerce platform built on open-source technology. Magento is available in two editions: Community and Enterprise. Create “magento.com” file in this location “/etc/apache2/sites-available/” with following content. Use a2ensite command and restart Apache to load the new configuration file. To ensure that the domain localhost.magento.com resolves locally to the computer require entries to /etc/hosts file. Now hit localhost.magento.com in your browser to check working status after completion of above entries. Now we will execute installation steps of main topic. Type following command on prompt. It will ask for root user password. Now lets create database for Magento. Now we have to insert sample data into database that we earlier created for Magento. Now everything is setup so open your browser and type localhost.magento.com and follow installation steps. You will find following screen. 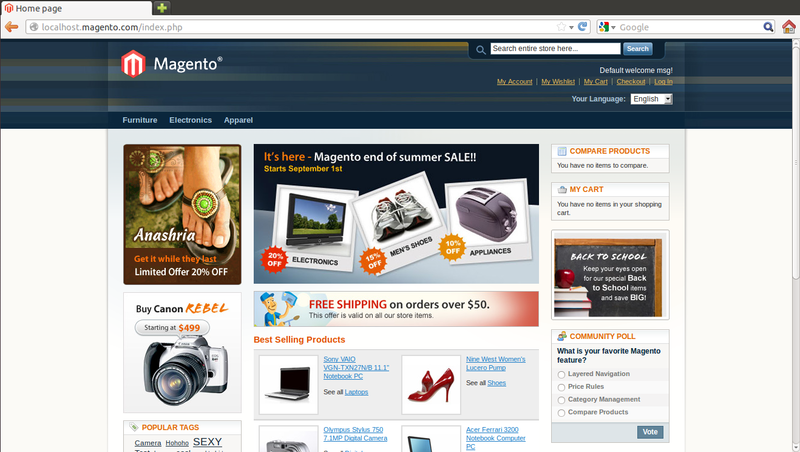 Here is your Magento is working. ← How to install Joomla in ubuntu ?